Weapons work shares many words with open-hand training, but weapons also have a lot of words of their own. There are a bunch of numbered things, too, and those can be really confusing until you have a sort of framework for understanding them. So here are some words about weapons stuff, starting with the basics. There will be another couple of posts going into jo words and bokken words. Often you’ll hear technique names with the numbers in Japanese. That will be another post, too. I’m just going to cover the wooden weapons we use in regular training here. Maybe we’ll look at katana, shinai, iato, shinken, and other weapons words later. Jo – The longer straight one that looks like a rake handle. Bokken – The somewhat shorter one with a little curve to it, like a sword. Also sometimes referred to as just ken. You’ll also hear tachi in the names of bokken or sword exercises. Tanto – The little one, about the size of a hunting knife. One of the most confusing things for me, when I was first trying to figure this stuff out, was sorting out the kinds of things we were doing. Not the specific instances, but the groupings. One exercise would be a suburi, another would be a kata, sometimes we practiced awase… I couldn’t figure out what was what. It’s hard even to describe. Let’s just get right to it. Suburi are discrete techniques, or very small groups of techniques, that you do by yourself. They are the very first things you learn. They are like learning words or phrases in a language. You’ll put them together later to form more complex expressions and conversations. You will see the suburi referred to in numbered groupings, like the “20 jo suburi” or “ken suburi 1-7” For some reason the jo suburi have names, and the bokken suburi are numbered. We’ll get into those in detail in a couple of other posts. Kata are sets of techniques, still done alone, strung together in a prescribed way, each flowing into the next. If we stick with the “suburi are like words” concept, kata are like poems. You memorize them and recite them. Like reciting poetry, everyone will have their own subtle ways of expressing kata, but we don’t change the words. You’ll hear numbers when talking about kata, too. The “31 jo kata” is everywhere – it’s a string of 31 movements. You’ll also see the 13 jo kata, which has 13 movements. No reason you couldn’t make up your own, either, but mostly we practice the set ones handed down to us. There are bokken kata, too. This is where the numbered stuff starts to get weird. The jo kata are made up of the number of techniques in the name: 13 jo kata, 31 jo kata, etc. But the bokken kata are numbered: bokken kata 1, bokken kata 2, etc. Awase are prescribed sets of techniques that you do with a partner. 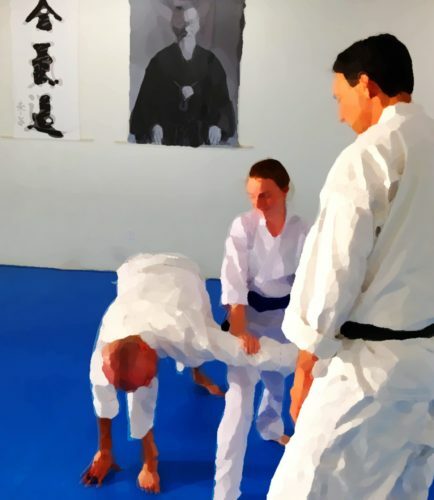 One partner in an awase does a familiar suburi or kata, and the other partner does the appropriate techniques that complement it. These are basic exercises to learn timing and distance when working in relation to another. The suburi you have been learning will begin to make more sense in the context of practicing awase. If suburi are words and phrases, and kata are poems, then awase are very simple conversations, the kind you learn when studying a new language. “Good morning.” “Good morning.” “Where is the library?” “Is there there, on the left.” “Thank you.” “You are welcome.” Very simple, perhaps a bit formal, and not quite how a real conversation might go, but a necessary step in becoming fluent. Kumitachi and Kumijo are partner practices that more closely simulate an actual fight, using the bokken and jo, respectively. The distinction between awase and kumitachi/kumijo seems fuzzy to me. There is a partner practice based on the 31 jo kata, for instance, that I see referred to both as the 31 jo awase and 31 kumijo. The numbers for suburi have nothing to do with the numbers in the names of kata. When you see “20 jo suburi” or “ken suburi 1 through 7” those are just describing which ones we’re talking about. If you have to do the “bokken suburi 1-5” on a test that’s just the first five descrete bokken techniques. Saito Sensei created a set of 20 jo suburi for us to practice. They are 20 separate exercises. The 31 jo kata, on the other hand, is a single flowing exercise incorporating 31 movements. Note that the 20 jo suburi are not the 1st 20 movements of the 31 jo kata. They are completely separate things. If, like me, you need to see stuff to understand it, here are some of my favorite examples to get you started. Each link here will open a YouTube video in a new tab or window. Remember that each dojo will do things a little differently.